Cloud computing has taken IT to a different level. It promises to improve the cost efficiencies, accelerate the innovations, the fast time to market and the ability to scale the applications on demand. When the hype grew up in the market, it has since then continued and there was a major shift towards cloud marketing and its benefits can be substantial. However, as cloud computing started emerging and developing it has shown rapid growth both conceptually and in reality. Still there are some challenges faced by cloud technology like legal/contractual, economic, quality of the service, interoperability and security and privacy issues. 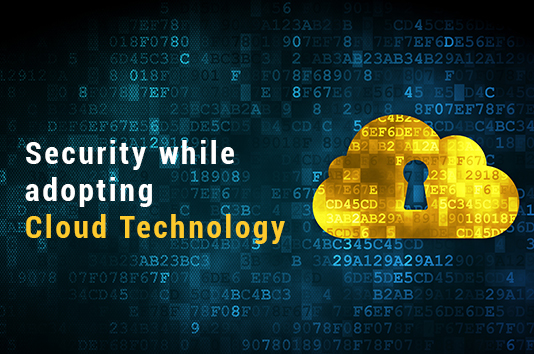 Only due to security threats cloud computing is not adopted by a lot of IT departments. - Public: This is available publicly - any organization can subscribe to it. - Private: The services are built according to the principles of cloud computing, but they can be accessed only within a private network. - Partner or Community: These cloud services are the ones which are offered by a provider to a limited and well-defined number of parties. There are a number of risks that are associated with cloud computing that need to be looked upon. Loss of Governance: Whenever a public cloud is deployed the customers cede control to the cloud provider over a number of issues that will affect the security. The cloud service agreements may not offer a commitment for resolving such issues on the part of the cloud provider, which tends by leaving gaps in security defenses. Responsibility ambiguity: The responsibility regarding the security can be split between the provider and the customer, having the potential for the important parts to be left unguarded if there is a failure to allocate the responsibilities clearly. This split may vary according to the models that are being used. Authentication and authorization: Sensitive cloud resources are the ones that can be accessed from anywhere on the internet which tells us that there is a need to secure it by using the identity of a user especially in the case of employees, contractors, partners and customers. A strong authentication and authorization is the need of the hour. Isolation failure: The multi-tenancy and the shared resources are the ones which define the characteristics of the public cloud computing. This will cover the failure mechanisms like separating the usage of storage, memory, routing and the reputation between the tenants. Compliance and legal risks: The customers investment can be lost if the cloud provider does not have a proper or appropriate certifications. So, the customers should check that the cloud provider gives the proper evidence. Handling of security incidents: The detection, reporting and the other security breaches can be delegated to the cloud provider but such type of incidents do have an impact on the customer. The notification rules should be negotiated in the cloud service agreement so that the customers have information about it. Management interface vulnerability: Interfaces that manage the public cloud resources are usually accessible through the internet. As they are accessed by a larger audience the resources used also are larger which pose higher risks. Application protection: The applications are generally protected with the defense-in-depth security solutions based on the demarcation on the physical and virtual resources on the trusted zones. The cloud provider needs to rethink about the network security according to the perimeter, users etc. same levels of user access control and protection should be applied to all the cloud services running in the traditional data centers. Creating and managing the workload-centric policies for implementing the centralized management across the distributed workload. Data protection: Here the main concern is about the availability about the sensitive data as well as loss or unavailability of the data. It is difficult for the customer to check the data handling processes of the cloud provider. This problem generally occurs in cases of multiple transfers. Malicious behavior of insiders: Damage can be caused by the malicious acts by the people working within the organization can be substantial by the authorizations they enjoy. It is compounded in the cloud computing environment as such activity can occur within either or both the customer and the provider organization. Business failure of the provider: These failures would render data and applications essential to the customer's business unavailable over an extended period. Service unavailability: This can be caused by hardware, software or the communication network failures. Vendor lock-in: The dependency on proprietary services of a particular cloud service provider could lead to the customer that is being tied to that provider. Due to lack of portability of the applications and the data there is a risk of data and service unavailability in case the provider is changed. Lack of interoperability of interfaces is associated with cloud services that similarly tie the customer with a particular provider that makes it difficult for switching to another provider. Insecure or incomplete data relation: The termination of a contract with a provider cannot result in deletion of any of the customer’s data. Backup copies of data usually exist and they can be mixed on the same media with other customers’ data which in turn makes it impossible to erase it selectively. The advantage of multi-tenancy (the sharing of hardware resources) represents a higher risk for the customer than a dedicated hardware. Visibility and audit: There are some enterprise users who create a “shadowIT” by using the cloud services in an unethical manner. The challenge for the security team is to know all the uses of the cloud services within the organization understand the rules and regulations, laws and the policies that apply such uses and access the security aspects. There are a number of security benefits offered by the cloud computing model. They are weighed against the risks that this model can bring with it. Security as a market differentiator: Security is one of the priority concerns of many cloud customers. Most of them buy the choices depending on the reputation of their confidentiality, integrity and resilience of the security services offered by a provider. It is a strong driver for the cloud providers for improving the security practices. Security and the benefits of scale: All the security measures that are used can be cheaper if they are implemented on a large scale. Hence, we can say that the same amount of investment can be used for buying better safety options. It may include defensive measures such as filtering, patch management, hardening of virtual machine instances and the hypervisors etc. some of the benefits that can be scaled are multiple locations, edge networks, correctness of response to the incidents and threat management. More timely, effective and efficient updates and defaults: The default virtual machine images and the software modules used by the customers which can be pre-hardened and updated by the latest patches and security settings according to the processes. The laaS cloud service APIs allow snapshots of the virtual infrastructure that are taken regularly and compared with the baseline. Most of the updates are rolled out many times rapidly across a homogeneous platform than the traditional client based systems. Rapid, smart scaling of resources: The ability of the cloud provider is to dynamically reallocate the resources for filtering, traffic shaping, authenticating, encrypting etc for the defensive measure which has its own advantages for resilience. Benefits of resource concentration: The concentration of the resources has its own disadvantages for security reasons and the obvious advantages is the cheaper physical parameterization and physical access control and the easier and cheaper application of many security-related processes. Security should be the main concern for cloud technology. Take Inspirria Cloudtech as your secured cloud provider partner with decade plus of experience working with 450+ Cloud projects. Push productivity to its optimum level with proven solutions, which is used by the best companies all over the world.